The weather is sunny and it's time to picnic. It’s picnic time for teddy bears! 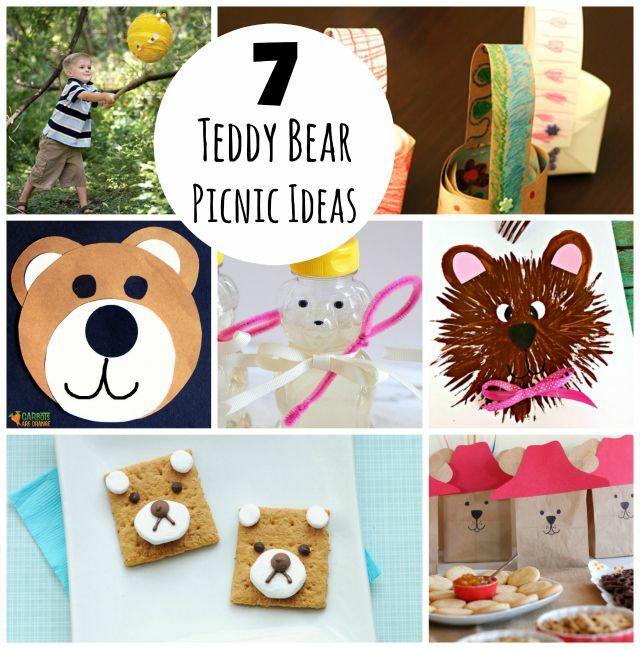 Join in on the fun in the forest with these 7 crafts to celebrate a teddy bear picnic. Make sure to go to the picnic in disguise as a teddy bear! Bears love honey. This DIY beehive piñata is easy to craft and would be a total hit with little kids. I love the tie in with bears and bees! Your kids will have a great time making these teddy-sized paper baskets. Color them with crayons, markers, or paint! Recycle old honey bottles into cute little bubble favors. Wouldn’t these be perfect for a teddy bear picnic themed party? Have fun bubbling! Bring these delicious bear s’mores to the picnic. These tasty treats are fun and simple to make. Use a fork to paint these cute bears. These pictures would look so cute hanging on your fridge. This is the easiest bear craft you will find! All you need is construction paper, glue, and a couple of colored sticker dots. Do your kids love Paddington Bear? Try these ideas for a super fun Paddington Bear themed party. Have fun at your teddy bear picnic!